Can you donate a pair of trousers for a refugee? The need for trousers today was very apparent as so many of the young refugees were wearing filthy or torn trousers. They can’t wash them and the dirtier they get the more they become a target for the police who can judge a person to be a ‘migrant’ on the state of their clothing. They are also young boys who want to look good and have clothes that fit. Today I was especially noting skinny legs and picturing the jeans in stock. The smallest pile in our warehouse is the trouser pile, and of the boxes that are there, so many are size 34 and above, much too big for the refugees. In fact you could fit two refugees into many of the trousers we have. There is never enough, it’s so hard saying no and seeing the dejected faces- I want to run out to Primark and buy all the small skinny jeans I can. 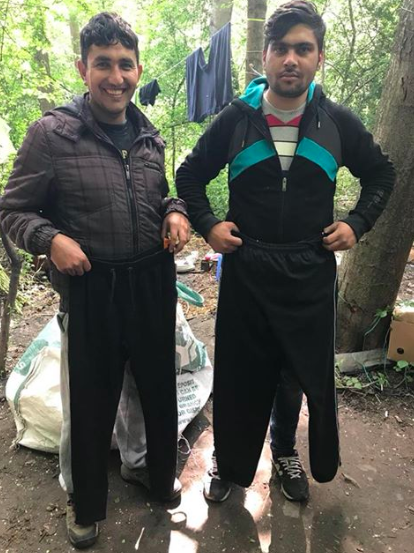 Have you a pair of jeans or joggers you could donate to make a young refugee happy, to make him feel safe, feel good and most importantly clean? For your nearest drop off point please see: https://goo.gl/ULD9dG or to donate go to: https://goo.gl/jmkx7A.